For the alternate version, see Animal Extermination (A). 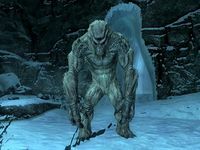 Fulfill a contract given to the Companions to clear out a beast den. Request work from Companion leader Aela the Huntress. Kill the boss beast in the random animal den. Once you have completed the Take Up Arms quest, you can begin work as a Companion. The Companions tradition of service dates back to the mercenary aid given to Ysgramor by the Five Hundred Companions. Since then the Companions have served as a group of impartial and independent contractors, helping out commoner and jarl alike in matters of might, but taking no sides nor making any alliances themselves. Locate Aela in Jorrvaskr. She has received a request from one of the Jarls that an animal den in their Hold be cleared of nuisance beasts. When you speak to Aela to ask for work she will reply, "The Jarl of <Hold > has asked for our help. It seems that predators have taken up residence and have been attacking farmers and travelers. Someone's got to head out there and take care of the beasts." "I knew we could count on you. Get it taken care of right away. Nobody wants an animal left roaming around in their place." or "Be cautious. Beasts are not nearly as predictable as men. Give the thing a quick death." Once you have killed the beast, return to Jorrvaskr and speak with Aela again. Let her know you have completed the task, to which she will reply: "Good work. The mindless cretins didn't stand a chance." Your reward of leveled gold will then be added. Although there may be multiple beasts at the targeted destination, only the boss beast (the one highlighted by the quest marker) actually needs to be killed to complete the quest. If the cave that it randomly chooses for you has already been cleared, you may run into a situation where the beast you need to exterminate has already been killed, and the quest marker will point at the corpse, making it impossible to complete the quest. This removes the ability to complete further tasks for the Companions, as they will remark that you have not finished your current contract. Even reanimating the corpse of the beast and killing it again will not fix the issue. This can be fixed with the console command setstage cr02 20. 10 I've been asked to take care of a <Alias=BeastBoss> lair in <Alias=DenHold>. 20 I cleared a <Alias=BeastBoss> lair in <Alias=DenHold>. On the PC, it is possible to use the console to advance through the quest by entering setstage CR02 stage, where stage is the number of the stage you wish to complete. It is not possible to un-complete (i.e. go back) quest stages, but it is possible to clear all stages of the quest using resetquest CR02. This page was last modified on 13 August 2018, at 02:29.